"A spicy homemade red pasta sauce paired with penne pasta and big meatballs. Really a palate-pleaser for the spice enthusiast." Mix beef, panko, 1/4 cup parsley, egg white, salt, and black pepper in a large bowl until combined. Form mixture into 12 meatballs. Heat vegetable oil in a large skillet; pan-fry meatballs in hot oil until browned on all sides, about 7 to 10 minutes. Remove meatballs from heat. Heat olive oil in a 6-quart Dutch oven or a large skillet over medium heat. Cook and stir mushrooms in hot oil until tender, about 5 minutes. Reduce heat to medium-low and add garlic and red pepper flakes. Cook and stir until garlic is golden, about 5 minutes more. Stir canned and fresh tomatoes into mushrooms and season with salt. Drop meatballs into tomato sauce and stir in sugar; bring to a boil over medium heat. Reduce heat to medium-low and simmer uncovered until sauce is reduced and meatballs are no longer pink in the center, about 45 minutes. Meanwhile, fill a large pot with lightly salted water and bring to a boil. Stir in penne and return to a boil. Cook pasta uncovered, stirring occasionally, until cooked through but still firm to the bite, about 11 minutes. Reserve 1 cup cooking water, then drain pasta. 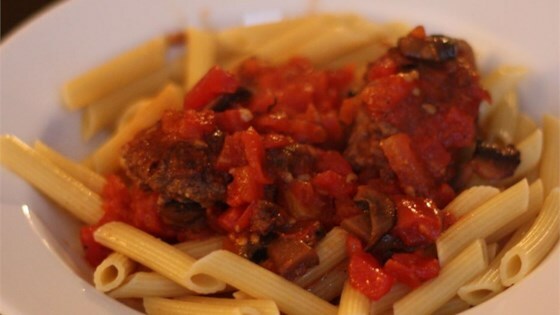 Stir penne pasta into meatball sauce; toss to coat. Stir pasta water into mixture if sauce becomes too dry. Sprinkle with remaining 1/4 cup parsley to serve. Make-ahead meal full of rich sauce! Not near enough sauce for 6 servings. And pretty bland, other than the red pepper. Had to add tomato sauce and italian seasonings to make it work.